Ausclimate’s back on the road again! Our expert sales team of Russell, Joanne, Chris and myself (Allan) will be demonstrating Ausclimate’s range of NWT Dehumidifiers at shopping centres and home shows across various locations in NSW and QLD. You can be sure to expect friendly expert advice from our family owned company and if you want to purchase a Dehumidifier on the day, you will be guaranteed to take home a bargain. Unsure which Dehumidifier you need to fix that moisture problem? Russell or I will gladly pop around to homes in the local area for a free no obligation inspection. We’ve had years of experience so you can feel confident in purchasing the right Dehumidifier to suit your home. To all our valued customers, if you’re in the area call in and say ‘hi ’and have a chat. We’d love hear your feedback and make sure that you’re still getting the most out of your Dehumidifier. Categories: news | Tags: dehumidifier, dehumidifier australia, dehumidifier brisbane, dehumidifier nsw, dehumidifier qld, dehumidifier sydney | Permalink. Boating and caravan enthusiasts – exciting news! Ausclimate has just relaunched the most powerful compact Dehumidifier on the Australian market, the NWT Compact Dehumidifier. This quality model has proven over and over again to be ideal in not just the marine industry but also perfect for caravans, storage rooms, walk-in robes, bedrooms – the list of uses just goes on and on. The highlight of this unique Dehumidifier model is its compact size and powerful moisture removal capacity. Standing at only 44cm high, it weighs 8.6kgs and extracts up to a whopping 12 litres of water per day! The sturdy base and low centre of gravity are great for boats and caravans, while its strong fold-down carry handle makes it easy to move and stow away in small places. Another great feature is its continuous drainage option. If you want to bypass the 2.5 litre water-holding tank, it’s as simple as unscrewing the drainage cap, removing the rubber bung and pushing on a 12 – 13mm drainage hose. This can be done in a matter of seconds! One last added bonus; if there’s a power failure, this dehumidifier will automatically re-start again once power returns. The dehumidifier’s manual start also makes it perfect to use with timers. Remember, all Ausclimate NWT Dehumidifiers are covered by a 2 year full replacement warranty for domestic use. To make a purchase or for friendly expert advice you can always call Allan or Russell, 7 days a week. 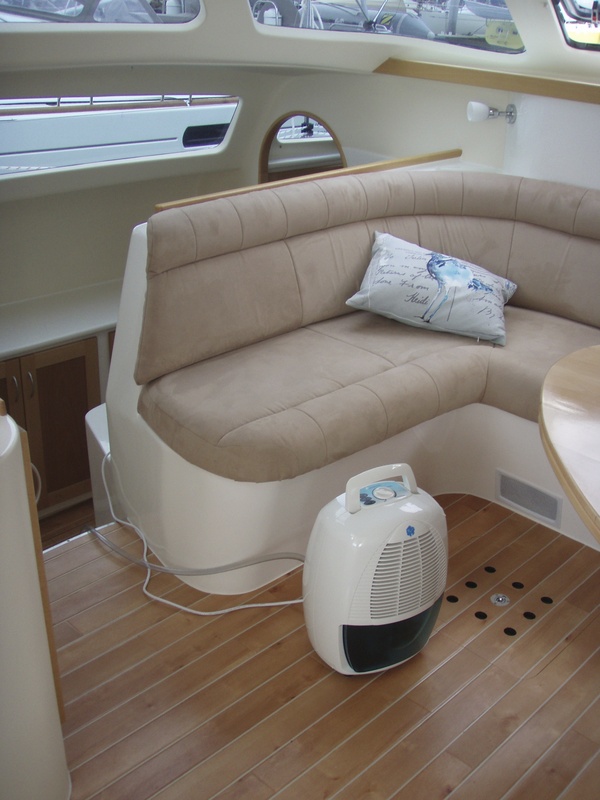 Categories: info articles, news | Tags: boat dehumidifier, boat moisture, boating, caravan, dehumidifier, dehumidifier new, dehumidifier qld, dehumidifiers | Permalink.